Generators are rated in either kVA (kilovolt amperes) of kW (kilowatts), Kilo meaning 1000. The kVA is always higher than the kW. This is because kVA is divided by the power factor to give the kW. 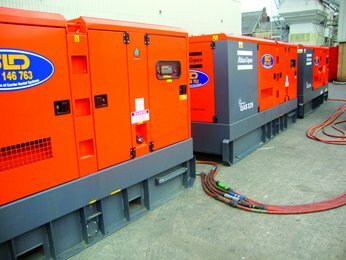 Most generators are rated with a power factor of 0.8.
kW (active power) and kVA (apparent power) the ratio of these two is the Power Factor. In a DC circuit the power in Watts is a product of Voltage x Current. The voltage and current peaks coincide to enable that the in-phase and the power factor are in unity. On an inductive load the current waveform is LAGGING behind the voltage waveform, the voltage peaks and current peaks are not in phase, the amount of phase delay is given by the cosine of the angle (Cos) between the vectors representing voltage and current. Hire Fleet Cable / Generator Size.